Interoperability makes it possible to have the right information at the right time for the right people to make the right decisions. Interoperability and collaboration are vital to positively transform health and healthcare for individuals and communities. When health information systems and technologies communicate with each other, information flows securely and appropriately within and across organizational boundaries. When patient data is securely and seamlessly shared, it is updated and appropriately accessible at all points of care. This provides a complete and accurate view of the patient – anytime and anywhere – resulting in safer, higher quality and more cost-effective care. • Individuals are at the center of their care. • Providers have a seamless ability to securely access and use health information from different sources where an individual’s health information is not limited to what is stored in disparate health IT systems. It includes information from many different sources and care settings. This includes technologies that individuals use and that portray a longitudinal picture of health, not just episodes of care. • Diagnostic tests are repeated only when necessary, because the information is readily available. • Public health agencies and researchers can rapidly learn, develop, test and deploy the very best in clinical, evidence-based guidelines. • With interoperable health IT systems, there is no need for patients with complex diagnostic and care requirements to carry boxes and bags filled with their medical records as they transverse the care community. • The ability for patients to log into one system to view all interactions, consultations, diagnoses and medical bills supports the overall picture of a longitudinal health record. • Open standards-based systems and internet protocol (IP) networks enable data to be moved securely from the enterprise data network edge at the point of care and delivered to an enterprise data center repository in the health information exchange or data network core. Compliance with interoperable data standards enables providers (clinicians) and consumers (patients, payers or other clinicians) of healthcare data to have secure access to that data. • Interoperable information technologies address these issues by supporting secure, ready access to patients’ health and payment histories. 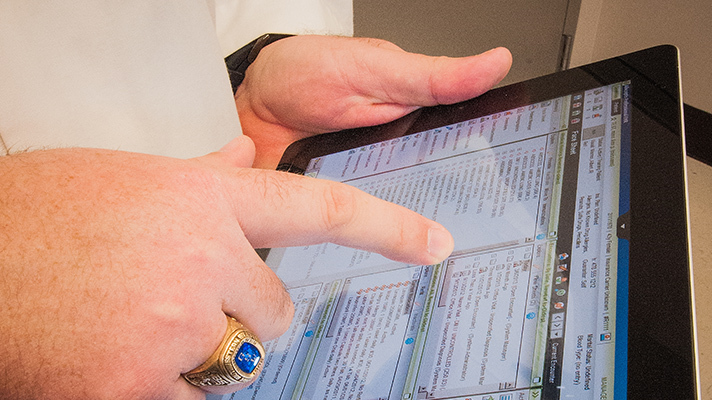 This enables smooth patient hand-offs across clinical settings and also improves revenue cycle management. • Open standards-based systems and internet protocol (IP) networks allow for secure exchange of electronic commerce between all entities in the healthcare value chain. This approach maximizes ROI as all players in the ecosystem are able to securely, quickly and efficiently access needed data to perform their job functions. • Resources that are leveraged across the care continuum – such as laboratory test results, data, images and clinical decisions – mean the work is not duplicative and wasteful. • Since patients (consumers) often see different clinicians for different reasons, their health information needs to be both secure and readily available to them and to their care providers. • Open standards-based systems and internet protocol (IP) enable simpler implementation of data sharing and networking across an Accountable Care Organization (ACO). The financial benefits of a multi-organization care delivery network would be more challenging without an interoperable data set, software applications and secure data networks. • Care teams, along with patients, can view the same computerized tomography (CT) scan and laboratory data and make joint treatment decisions, together, even though they may be miles apart. By getting the right information to the right people at the right time, interoperability saves money and, more importantly, it saves lives. But, interoperability is not an overnight process; it is a journey that leads to many positive outcomes. To realize the full potential of health IT to improve the delivery of healthcare, achieve better health outcomes and reduce costs, the industry is encouraged to focus on opportunities to support interoperability that will enable widespread, secure health information exchange.